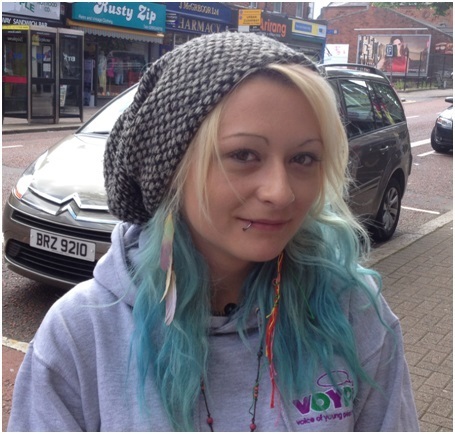 Lorna (20) is living in south Belfast with two other care leavers. She is on a programme with Springboard, volunteers with VOYPIC and hopes to go on to university. I went into care when I was 14 and I have lived in both foster care and in a children’s home. There were a lot of difficult issues living in care but most of my positive experiences were based on good relationships with my foster carer and the staff in the home. It would have been a lot worse if I had not had those relationships and trust. I left care just after my 18th birthday as it’s not usual to stay in a children’s home after the age of 18. My preparation for leaving care was very rushed and I think they could have started preparing a lot earlier. I went to live in a rented flat by myself. It was very hard to move from a high supported home to a flat living on my own and knowing no one around me. I was very close to two other care leavers so after I had lived for a year on my own we decided to chip in and get our own place together and make a fresh start. It has been brilliant since. My confidence is a lot better and we all help each other out. We have all lived in care so know how vulnerable each other are. We support each other in our education and from being in care know how to be very understanding of each other. We are now all going places in life and I don’t think I would have been able to do that on my own. Care planning is a massive issue and the contact I had with my family varied during my time in care. If you are looked after away from home you are going to be a lot more settled if you know what is going to happen to you and when you are going to see your family. Involvement in LAC review meetings makes the experience a lot smoother and less distressing. It is already a stressful situation to be taken out of your family home. To be uncertain about what is going to happen with your placement and not to be involved with that is even more unsettling. I do think that social services should help to make young people feel more involved in their lives. I knew that there was a care plan for me, I did hear what was in it when I went to my LAC review meetings but I did not get a copy of it. It would have been better to have felt more engaged in the decisions and plans about my future. They weren’t available when I was in care but I think they are a brilliant idea. The main focus should be on children and young people in the system. Their life story is something that they can own instead of all the big official documents they may not want to be involved with. Social workers can change a lot for young people in care. You need to have a healthy bond with your social worker to be able to ask and find out information. A change in social worker can put a lot of young people off seeking that information. Ideally, you want to feel that you can pick up the phone and ask them questions and be able to sit down and talk through things with them. I have had around five social workers during my four years living in care and since leaving care. The majority of them were nice and I did build a relationship with them but there were a couple who were not suited to me. Many people living in care do have trust issues because of their experiences so building a stable bond with someone is very important. I was looked after away from home but I still have a right to my education and this is so important for the future of young people living in care. I was taken out of education for various sound reasons but I was determined to get my education and got my four GCSEs. I am now trying to make up for the time I missed out on at school. Living in care and then going into school with everyone else can be hard. People do treat you differently when you live in a situation that is different from the traditional family home. We do feel different. There should be more support as we still have a future and should be given opportunities. There is a need to make sure that children in care know their potential and the options open to them. Opportunities should be provided for young people who have left care to make up for the years they may have missed in education because of what was going on in their lives. Imagine the stress of moving placement or family breakdown or living away from home. Once you leave the system and start to get a handle on your life like me, you need opportunities like training and education and ways to make up for those years. I’m sure all kinds of services can be improved, not just this one. But this service is so important because it is people’s lives and children being brought up by health trusts. There should be a lot of emphasis on making living in care as good as it can be because it might set the scene for the rest of your life. The stigma attached to living in care needs to be addressed. We do have the same potential as other children and can go places. We just need support from social services, advocacy and the community. Lorna asked that her surname was withheld.